An online search for the meaning of “risk management” produces a variety of definitions, with some that are sector-specific. So how is this fundamental business practice applied when it comes to the FinTech sector and the choice of cashier software? Why am I experiencing so many payment rejects? Is there anything software can do to help me know my customers? Can I avoid using a single payment service provider (PSP)? 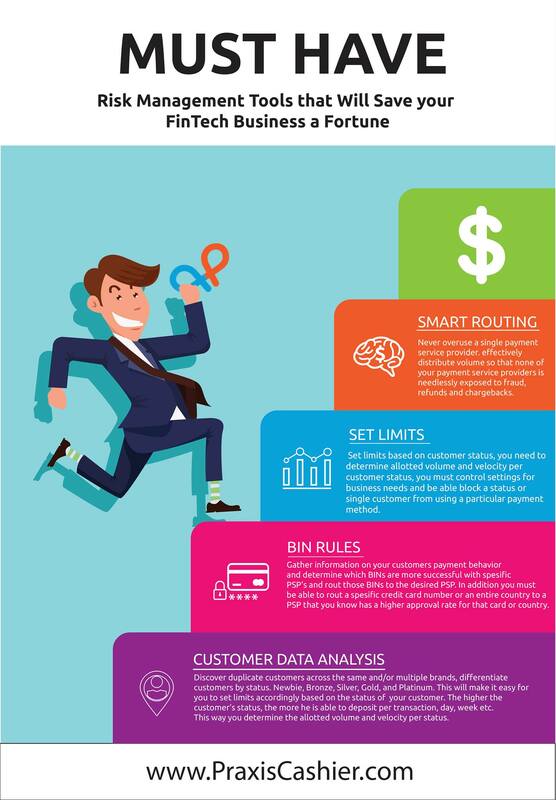 High caliber cashier software will ensure that a FinTech business has the essential risk management tools at its disposal in order to maximize profits on every transaction. The accompanying infographic offers a visual explanation of the required risk management tools but a further explanation is in order. Customer data analysis tools allow the user to identify duplicate customers across a wide range of brands. A common business practice is to differentiate customers by status and this should be a key requirement for any cashier software. These tools allow the FinTech business to calculate the proper volume and velocity for each customer status resulting in an enhanced bottom line. Bank Identification Number (BIN) tools provide the means to route transactions to the most reliable PSP. BIN rules provide a window for learning the payment history of customers. With these details in hand, it is possible to ascertain which BINs are more favorable with specific PSPs and route the BINs accordingly. The ability to earmark a specific credit card or even a country to a PSP is a real game changer. Why? You can then couple this tool with a PSP that has a better approval rate for the card or country. Tools to set limits are absolutely essential for a variety of reasons. Limits are properly linked to customer status. Accordingly, a FinTech business will specify volume and velocity limits for each category. However, the ability to control settings based on business decisions means having the option of blocking an entire customer status or an individual customer from using a particular payment method. Every FinTech business faces situations where this tool comes into play. Smart routing is synonymous with a smart business practice. Overusing a single PSP is neither good for a FinTech firm or the PSP. A firm wants to maintain a solid professional reputation and by effectively distributing volume a PSP will understand they are serving a quality partner. No PSP wants to be unnecessarily, even recklessly, exposed to fraud, refunds and chargebacks. When it comes to selecting an initial software cashier or switching to a new one, keep in mind the absolute importance of these risk management tools and their vital role in the conduct of your business. Praxis Cashier is definitely the address where you can receive the very best of these tools.